‘It was like being in love, but more…And now, one year later , Delia is dead. I love a good suspense novel, after glancing at this I had to get it, because it just sounded too damn good. June and Delia were best friends, closer than sisters, until they grew apart, one night Delia dies but June knows that things don’t quite add up. They say it was suicide, but June is convinced it’s murder and will go to any lengths to find out the truth about her best friend. This is the best kind of thriller, once you think you know what’s going to happen a twist comes out of nowhere and you’re floored and devouring the book to find out what happened. I give you fair warning Suicide Notes From Beautiful Girls will keep you up all hours of the night not only reading it but also trying to work out what really happened, was it suicide? Did someone have a grudge against her to the point of murder? It helps that Delia is a character who is very unpredictable and June knows it. I thought the character of June was well written, there is really hurt, pain and confusion that you can feel as you read the book. I felt that she was very real to the reader, with her own feelings and problems outside her search for Delia. I found the book similar to Far From You but in a good way because both have completely different characters and endings. If you like this novel that is another one to check out later. There are a lot of suspects in this novel, people who could have murdered her and it drove me half crazy as I came up with theories for each and every one of them, not once did I get to the truth. The fact that I never got it but the ending was so well planned really made me amazed at Weingarten’s talent as an author, I think she is definitely one to watch in YA literature and I wouldn’t be surprised if this made a great film later on. I saw that because this would make a much better film plot than Gone Girl ever did. Of course I’m going to give this review 5 stars *****!!! This really is a brilliant book and I’m so pleased my book club chose this as the novel to read for this month, it’s brilliant. I’m now planning to read the rest of Weingarten’s novels and hope they are just as addictive and satisfying as Suicide Notes from Beautiful Girls. I hope you all enjoy and please let me know your thoughts. Have you read any other Weingarten novels? 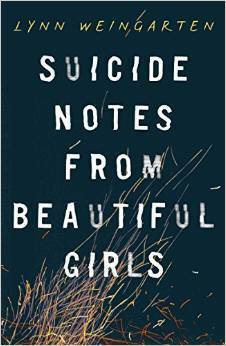 Or have you read Suicide Notes from Beautiful Girls already? As always let me know in the comments!